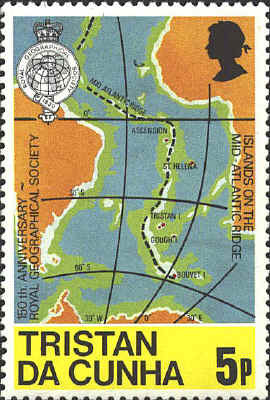 The Mid-Atlantic Ridge is also illustrated on the stamp from Tristan da Cunha. Molten rock from the earth's interior oozes out of fractures and causes the earth's mantle to spread about an inch each year. 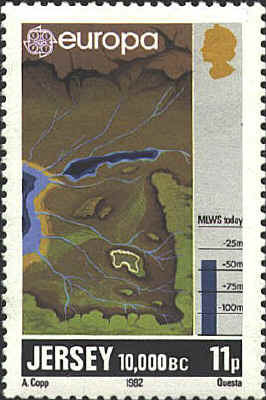 The face of the earth has changed dramatically over the course of the millenia. From Pangaea to Lauasia and Gondwanaland; from ice ages to global warming; from thermal convection to plate techtonics we know some of the forces that have acted on the earth. 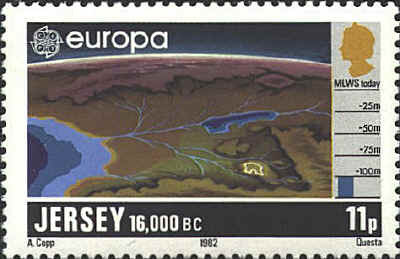 The stamps from Jersey show us what the effects of those forces may have been. 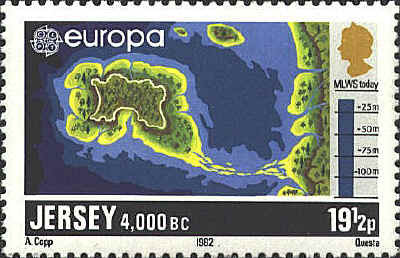 From 16, 000 to 4,000 B.C. 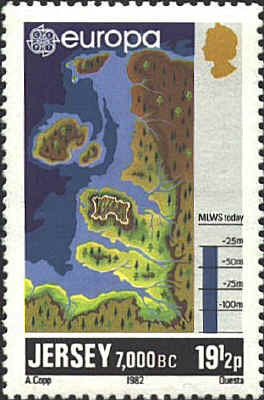 we see the effect of the filling of the Atlantic basin near the coast of France, gradually raising the level of the sea to an approximation of the present levels around the island of Jersey.